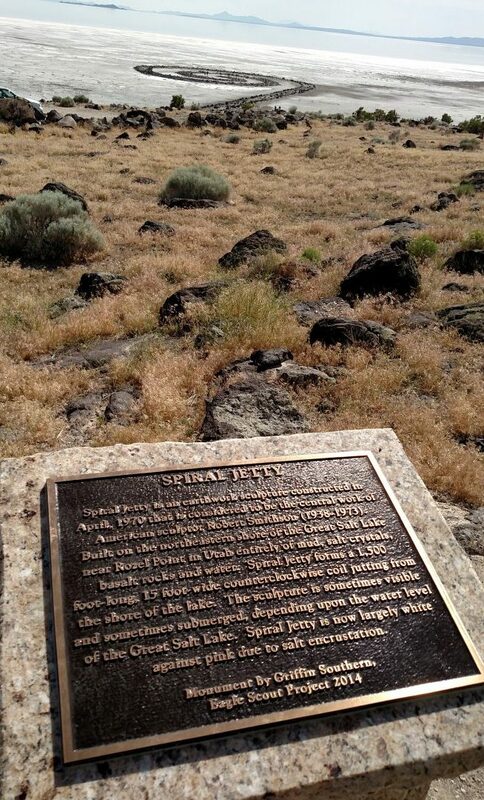 If you stay on the road past Stinky Springs, you’ll see a left turn that will take you to the Golden Spike monument. If you have some time for a detour, continue straight instead to the Thiokol (ATK) compound. Just outside of the ATK building you’ll see a bunch of rockets on display. The garden is free to the public, and the detailed signs make it great for self-guided tours. I giggled about the “garden” bit, because it is all full of gravel and rockets, but we had fun. The National Historic Site is pretty easy to find, since there are brown signs telling you where to go from I-15 all the way to the site. There are lots of fun activities and a museum, so plan to spend some time here. 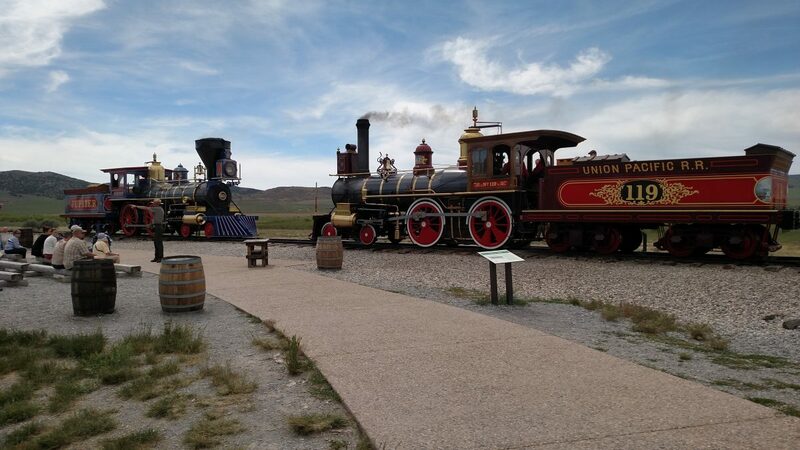 If you come on a Saturday between May and mid-September, you can participate in a re-enactment of the driving of the last spike in the transcontinental railroad with replica steam engines and a crew of actors. We are also huge proponents of the Junior Ranger program for people of all ages. You can learn more about the site than you would without the handy booklet, and if you finish you get a badge. The Spiral Jetty is a huge installation put in by artist Robert Smithson in the Great Salt Lake not far from the Golden Spike monument. The jetty is made of volcanic rocks that spiral out onto the salt flood plain. Because we are constantly in a drought out here, you can walk out on the jetty and get a close-up of the salty landscape. If you’re feeling adventurous and have a spare tire (or three) on your truck, you can actually drive on the old railroad grade west from the monument. When the ranger told us to watch for railroad spikes, we thought he was kidding. He wasn’t. Turns out when they tore out the rails they left a lot of the spikes along the grade. After Gordon saw the first one and jumped out to check it out, we spent the drive happily looking for more and seeing who could find the most. Just try to find them with your eyes instead of your tire. Bright side, I found out just how fast Gordon can change a tire. If you take the grade all the way out, it will connect to dirt roads that lead to ghost towns and some awesome desert scenery. And if you go far enough, you’ll get to the Sun Tunnels. 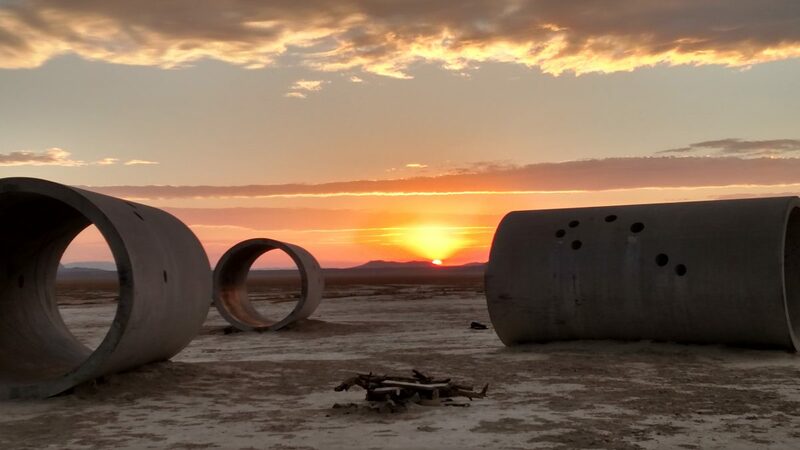 The Sun Tunnels are another art installation, created by Nancy Holt (who was actually married to Robert Smithson). To get to the tunnels from the north, you have to drive through the ghost town of Lucin, near the Nevada border. The Tunnels are huge cement tubes that are placed to line up with sunrise and sunset on the solstices. Each tunnel also has holes drilled in the top forming constellations. You can visit them anytime, but if you go on the solstice you can expect a decent-sized crowd (made up mostly of hippies and grungy college students) there to celebrate. 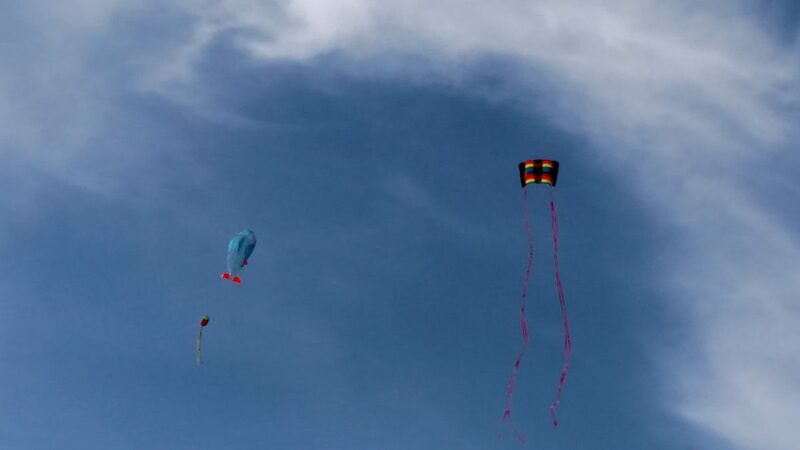 If you’re going out to the middle of the desert, bring kites. The wind is perfect. You can either drive back through Park Valley, or make your way south toward Wendover and come back on I-80.